I apologize for being so behind at getting the posts up for the Victorian Challenge. With starting my new job, I’ve gotten very behind at writing my reviews and have also lost the amount of time I used to have to write them. I am getting caught up so hopefully I will be more on top of getting these up and posted. As I didn’t get May posted, we are going to celebrate both George Eliot and Sir Arthur Conan Doyle this month. 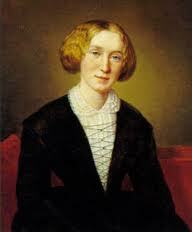 George Eliot is the pen name for Mary Ann Evans. She was one of the leading writers in the Victorian era, writing such seminal works as Middlemarch, Silas Marner, Daniel Deronda, The Mill on the Floss, and Adam Bede. All of her novels are set in provincial England. She was born in 1819 to Robert and Christiana Evans. Robert was a manager at Arbury Hall Estate. Robert and Christiana decided that young Mary Ann was not good looking enough to make her way in the world through marriage, so they invested in her education. Later in life, she used this education and moved to London. She became an assistant editor of The Westminster Review in 1851, which was highly unusual for a woman of her time. Also in 1851, she met George Henry Lewes, a married man. He left his wife and moved in with Evans in 1854. They lived together until his death in 1878. This was very scandalous for the times. For this reason, and to be taken more seriously, Evans used a male pen name and started to work on her novels. They were well received and very popular, even with her shocking private life with Lewes. She published seven novels in her life time; with her last novel being Daniel Deronda. After Lewes’s death, she married John Cross, a man twenty years her junior. She died about seven months later at the end of 1880 at the age of 61. For the Victorian Challenge, I listened to and loved Silas Marner earlier this year. Previously I had read one Eliot novel, Adam Bede. I have a new copy of Middlemarch sitting on the top of my pile that I REALLY want to read this month. Unfortunately, I am overbooked for the month, so I may not get to it until later this year. I will read an essay, poem, or something Eliot for sure though. What Eliot novels, essays, novellas, and poems have you read (or watched)? What is your favorite? Sir Arthur Conan Doyle was a prolific Scottish writer, most famous for his creation of Sherlock Holmes. Holmes is an iconic figure and the stories about him are considered a milestone in crime fiction. Doyle was born in 1859 in Edinburgh Scotland. Doyle’s father was an alcoholic and his family lived in squalid tenement flats. Luckily, he was supported by wealthy uncles and sent to a variety of good schools. He studied medicine at the University of Edinburgh and become a doctor in 1881. It was while he was studying to become a doctor, that Doyle first started writing short stories. Doyle struggled to find a publisher for his works, but Ward Lock & Co published his first significant work, A Study in Scarlet, in 1886. This story was the first to feature Sherlock Holmes and Watson. The Holmes stories were wildly successful. In total there were four novels, and 56 short stories by Doyle featuring Holmes. He “killed” Holmes off in 1893 to focus on his “more serious” historical works, only to revive Holmes again in 1901 after vast public outcry. Holmes married Louisa Hawkins, the sister of one of his patients in 1885. Together they had two children. She had tuberculosis and died in 1906. He married Jean Elizabeth Leckie the next year and had three more children. Doyle died of a heart attack in 1930 at the age of 71. I have read the complete Sherlock Holmes by Sir Arthur Conan Doyle and loved it. For the Victorian Challenge, I listened to The Sherlock Holmes Theatre earlier this year. I’m going to reread a story this month as part of the challenge. I am also watching the Sherlock series on Masterpiece Mystery and hope to have my review on that as well. What works by Sir Arthur Conan Doyle are you planning to review? I look forward to reading your reviews this month! Please post the name of your blog followed by the item you reviewed. For example, Laura’s Reviews (Middlemarch). What a terrific post, Laura! I am interested in reading more Sherlock Holmes. I'm not sure I can participate in your challenge this month, though, and in fact will not be blogging for about a week, after today. I am a big fan of both Eliot and Conan Doyle--loved her post with background on both. I'm midway a long project of reading all of Eliot, and Romola is up next. I've read Middlemarch multiple times and count it among my favorite all-time books. I love Silas Marner and have read it multiple times, read Adam Bede twice, and liked it better the second time. I was disappointed in Mill on the Floss, primarily because all my life people have been telling me how much I would love it, so expectations were high. I'm currently rereading the SH stories, and just watched the first season of Sherlock, which I loved and recommend. Thanks Jane! It sounds like you are quite the fan. I look forward to reading your reviews. I recently finished Lyn Shepherd's Tom-All-Alone's which uses settings and characters from Bleak House to tell a murder mystery story so I thought I would count that one for the Victorian Challenge. I am hoping to read some Doyle and maybe re-read Arthur and George Julian Barnes great novel about Doyle, I will see how I go. Hi, just posted on my Doyle read which was Lost World. I have also re-posted on a couple of Shelock Holmes novels I read last year. Doyle is such a comfort read. I've just added some reviews to my blog for June's George Eliot, I read the Lifted Veil, an interesting short novel (or long story). I've also added a review of A Study in Scarlet by Conan Doyle. Both reviews are now in the tab at the top labelled Laura's reviews. Interestingly last night I started watching Summer's Lease again (DVD) and there is a book on the bed open at Copper Beeches, interesting how there are parallels in other things you see, maybe I will revisit Copper Beeches too!! Made a mistake. Signed in June at www.literaryodyssey.blogspot.com.Since June, I've read 9 books: biographies, autobiographies, art and travel narratives. I just posted, but don't see it. I also wrote it was the Jan.2012. I know it's the June-July challenge. Help!